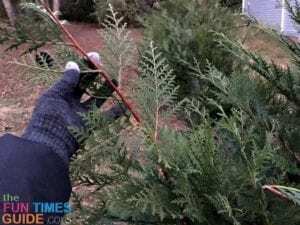 Want some simple outdoor decor using fresh greenery this Christmas season? Bust out your summer flower hanging baskets and try these easy Christmas arrangements in your hanging baskets! I started decorating for Christmas immediately after Thanksgiving. This year, with my son almost two, I was excited to jump into the spirit of the season by decorating the inside and the outside of our home. I walk my dogs every day — so it’s easy for me to get inspired by Mother Nature and all of the beautiful colors and textures she provides for us. I really wanted some fresh greenery around the house, so I thought I should try to use materials that I had readily available — without having to spend a small fortune. I had a double shepherd’s hook and coconut-lined hanging baskets from my summer plants. 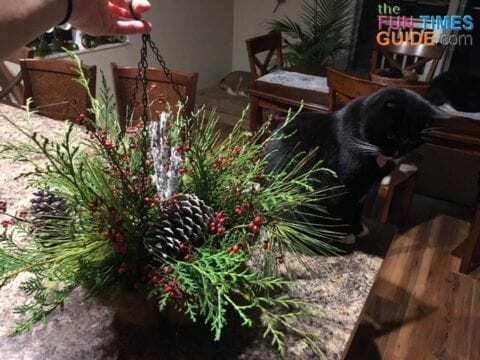 All I needed was some festive greenery to put into those hanging baskets for the holidays. 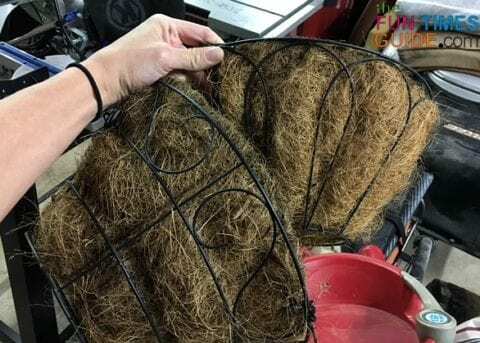 After a trip to Hobby Lobby, I realized that I could easily replicate some of their hanging basket ideas using real greenery from my own backyard without having to spend a dime! 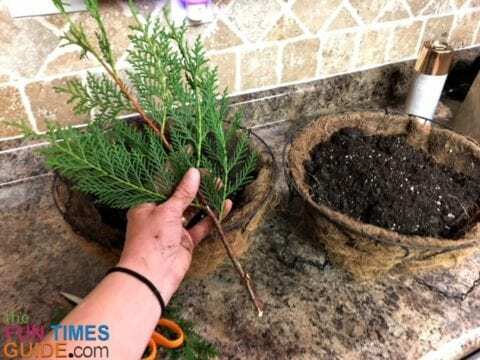 These hanging baskets take less than 10 minutes to make once you’ve gathered all the materials. 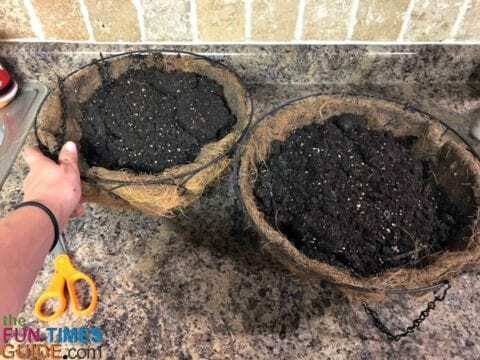 I filled the hanging baskets with potting soil. I held the Leyland branches like I would dump spaghetti into a pot and put them in the center of the basket — folding them down to lay and fill in the perimeter. I cut Pine tree branches down to bunches with a stem and plugged in these pieces anywhere I thought could use the lime green color. 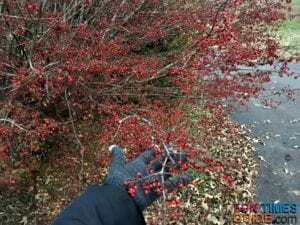 I filled in the gaps with the red Winterberry for punches of color. 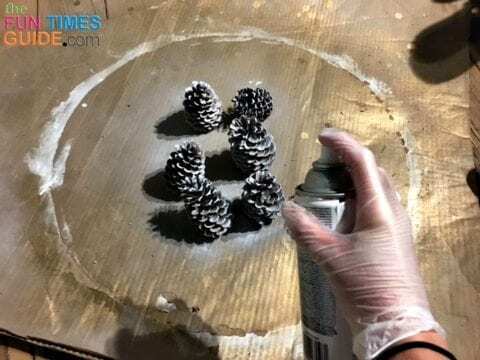 I decided I wanted to add some white in these Christmas hanging baskets — so I spray painted some pine cones and added 3 per basket. I added 1 crystalized twig (left over from a previous project) to the center of these Christmas arrangements. I hung the baskets on shepherd’s hooks — just off the side of the front walkway and steps. I added water to the soil to help keep everything hydrated as long as possible, and I continue to water every few days. 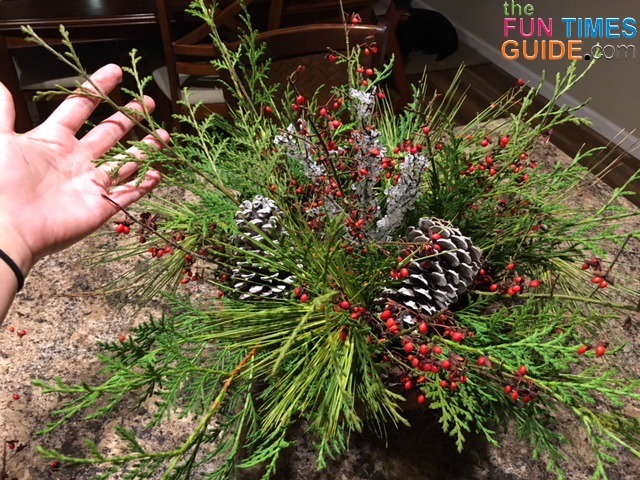 I absolutely love how these outdoor Christmas arrangements turned out! They add a festive and welcoming touch to our home. I think I’d like to line the walkway with a row of these because I have several more shepherd’s hooks and hanging baskets just begging to be filled. The best part about these Christmas arrangements is they didn’t cost a thing, and they will just return to the earth after the holidays. 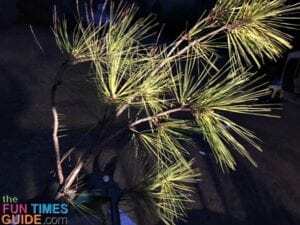 No storing… and no adding to the landfills! 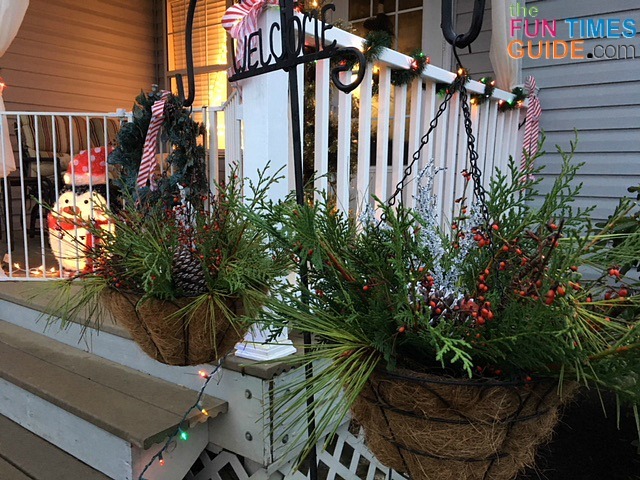 Since these are the first ones I’ve made, I have no idea how long these outdoor Christmas arrangements will last — but I do suspect they will fair better in the cooler states versus somewhere like Florida. I will be keeping the soil moist, so they should last throughout the holidays. But if not, I can easily refresh the baskets with fresh clippings, as needed. 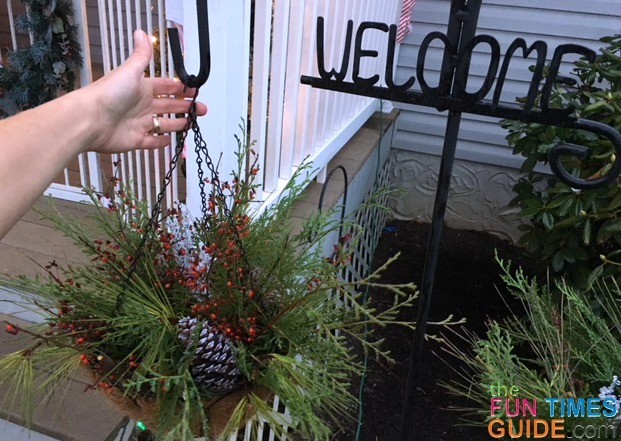 I hope this Christmas hanging baskets tutorial inspires you to take another look at your surroundings and see what Mother Nature provides for arrangements that you can create… Merry Christmas!